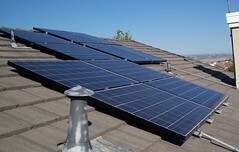 Because of high up-front costs, many homeowners are reluctant to build and install their own solar system. Is there is a way to keep those costs low? This may be the answer, solar leasing. Read about it here. Wow! A free custom design and installation. The lease fee combined with your lower electric bill, should cost less overall than what you are paying now. The lease is transferable to the new homeowner if you sell, or you can buy the system and add it to the home’s asking price. What a deal! This entry was posted in General, Save Money by admin. Bookmark the permalink.